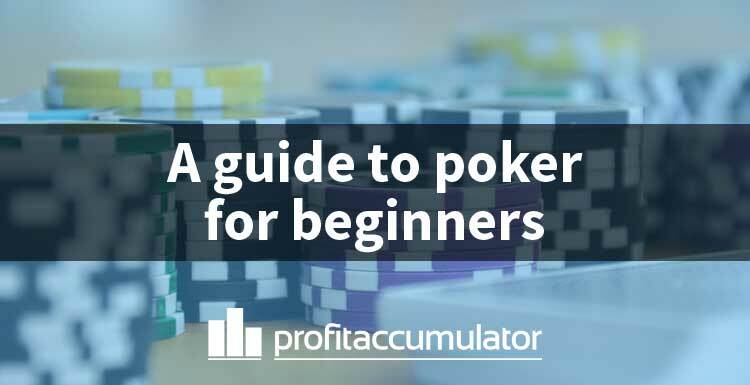 This poker for beginners guide is to help get to grips with the basics for our Poker Offers section. Here you will find information on the following:. Before we properly get started, there are a couple of things to mention. There are many different forms of poker with their own specific rule sets and strategies. This guide will be focusing specifically on No Limit Texas Hold'em as this is the most popular type of poker, as well as the one you'll be seeing most often when tackling offers. "Poker is a game that takes minutes to learn but a lifetime to master." Poker is a very complex game at the top level so we will just be touching on the very basics to allow you to gain a better understanding of the profitable poker offers we have on Profit Accumulator. For anyone interested in learning more about poker, there are some links at the bottom of this guide. Texas Hold'em is typically played with between 6 and 10 players at once (but can be played with as little as 2). In our example below we have 6 players. Chips - The number next to each player is how many chips they have. 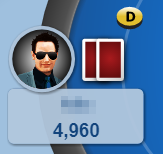 This particular player has 5,000 chips. Pot - The number of chips currently in the pot. This is the amount that can be won from the current hand. In this example it is 30 chips. Dealer - The circle marked with a 'D' or sometimes 'Dealer' shows which player is currently the Dealer (no actual dealing of cards is necessary from the player in online poker but the position is still relevant). After each hand the dealer will change to the next player along in a clockwise manner. 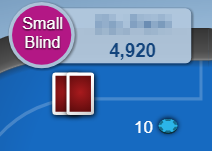 Small Blind - This is the player to the left of the Dealer and they must contribute a certain amount of chips before the hand begins (determined by the current stakes of the game). In this example they have been forced to add 10 chips to the pot. Big Blind - This is the player to the left of the Small Blind and they must add a larger set amount (usually double) of chips to the pot as the Small Blind before the hand begins. In this example they have been forced to add 20 chips to the pot. Firstly, every player is dealt two cards face down (only you can see these two cards). This starting hand is also known as your 'hole cards'. There will then be a possible four betting rounds (should the hand make it until the end). These are known as Pre-Flop, The Flop, The Turn, and The River. During each round players take it in turn to make a decision in a clockwise order around the table. Keep in mind throughout these instructions that the aim of the game is to make the best possible 5 card hand out of the 7 cards eventually available to you. No guide to poker for beginners would be complete without a breakdown of hands, but before we get into each stage of the game, here are the options you'll have when it comes to your turn at the varying stages of the hand. Bet/Raise - Betting and raising both mean to voluntarily add more money to the pot. The small difference is that we call this action a bet when no other players have added money to the pot before you this round. We call this a raise if there has already been some money added to the pot in the current round. If we make a bet/raise, then the next player must choose whether to match our contribution to the pot (call), or throw away their hand (fold). Call - To remain in a hand (and hence have the opportunity to play in further rounds and ultimately have the chance to win the pot) after a player has made a bet/raise, you must match the amount they place in the pot. This is known as a call. If no players are prepared to call and they choose to fold, then the player who bet/raised will win the pot and the hand is over. If at least one more player calls then you move on to the next round. Fold - If a player has bet/raised before you and you don't feel like your hand is worthy of calling or raising (we will explain the basics of what makes a good hand later), you can throw your hand away and not take part in any more rounds of that hand. Pre-Flop - After every player has been dealt their two cards, we begin the first round of betting which is known as Pre-Flop. The first person to make a decision in this round is the player to the left of the Big Blind. In this particular round, you have the option to match the amount of the big blind (call), add more money to the pot (raise), or get rid of your hand (fold). All outlined in the betting options above. The Flop - Once the first round of betting is complete, three cards are dealt face up in the middle of the table. These are known as community cards as everyone is allowed to use them along with their hole cards to make up their overall hand. All the money from the Pre-Flop round remains in the pot and we start betting again. This time, the first person to make a decision is the player to the left of the Dealer. Remember that any players who folded in the previous round are now out of the hand and should be skipped. Now, you have the option to pass to the next player (check) or add more money to the pot (bet). Note that there is no need to fold unless a player has added money to the pot during the round. This is because you have the option to check and possibly move on to the next round for free if all other players agree to do the same. As soon as someone has decided to bet, the option to check is over and now players must either call or raise if they want to move on to the next round. The Turn - If we still have active players, a fourth community card is dealt known as The Turn. This is once again a card available to all players. The order of play is exactly the same as on The Flop and it starts with the player to the left of the dealer. The River - The last round is The River. One fifth and final community card is dealt and betting takes place in the same way as for The Flop and The Turn. Players still in the hand now have 7 available cards (2 hole cards + 5 community cards) to make their best possible 5 card hand. It is important to note that you don't have to use your hole cards. You can use 0, 1 or 2 of them if you wish to contribute to your best 5 card hand. The Showdown - There will often have been a winner of the pot before The River is dealt (when everyone has folded apart from one player), but when there are 2 or more players still in the hand we come to The Showdown. Cards are revealed and the player with the best hand takes all the money in the pot. In the event of a tie the money will be split. High Card - The highest card when none of the better hands below are shown (eg. High card Ace). Pair - Two matching cards and three unmatched cards (eg. Pair of Queens). Two Pairs - Two sets of matching cards and any fifth card (eg. Pair of Queens & Pair of Tens). Three of a Kind - Three matching cards and two unmatched cards (eg. Three Jacks). Straight - Five cards of any suit in sequence. Flush - Any five cards all of the same suit. Full House - Three matching cards and two other matching cards (eg. Three Jacks and two Nines). Four of a Kind - Four matching cards (eg. Four Kings). Straight Flush - Five cards of the same suit all in sequence. Royal Flush - The highest possible straight flush. Played on a single table. Usually played with more players at once hence consist of multiple tables. Money/chips at the table are in cash (eg. £2.50 of chips is worth £2.50 in real money). Players can start with differing amounts. Players buy in for a fixed entry free before the tournament. All players are given the same amount of chips which are only relevant within that tournament (eg. Entry fee is £5 for each player and everyone receives 2,000 chips). Players can leave a cash game at any time and take their winnings with them. Tournaments don't end until there is one player with all of the chips. Players are paid based on how far they got before they were knocked out. The blinds (Small Blind/Big Blind) will remain the same at all times. The blinds will increase as the tournament progresses (eg. Every 10 minutes). If you lose all of your money/chips in a cash game, you can buy back in to the same game to play again with more cash. If you lose all of your chips in a tournament then you are out of that tournament and can not continue playing (unless there are specific re-buy rules). The casino takes a cut of every pot (called a rake). The casino takes its cut from the initial buy-in fee. As briefly mentioned above, the rake is a commission fee that the casino charge on each pot played in a cash game of poker. This will usually be a percentage of the total amount in the pot paid by the winner. When playing online poker this process will be done automatically. In tournament games there will not be a rake on each pot, instead the casino will charge you extra for your buy-in fee for the tournament. This will often be displayed as "£5 + £0.50" where £5 will be added to the tournament prize pool and £0.50 will be taken by the casino. Most poker websites will have a system where you accumulate points for the rake you've generated. In a nutshell - the more you play, the more points you will gain. These points can be redeemed for prizes, but more importantly, they are our measure of how close we are to completing certain offers and being able to withdraw funds as cash. As an example, here is Party Poker's points system.